Another child and the woman driving the vehicle were critically injured in the accident in Oss, a town near the German border around 110 kilometres (65 miles) southeast of the capital Amsterdam. Police said they were investigating reports that the brakes had failed on the wagon, which was taking children from daycare to school, as it approached the level crossing. Two of the children who were killed were aged four, while the others were aged six and eight, ANP news agency said. Two of the dead youngsters and the injured child, who is 11, come from the same family. "Today, every family is hit, and the accident leaves a big gap in families, the daycare centre and school," said Wobine Buijs, the mayor of Oss. The electric cart, known as a Stint, features a Segway-type standing area for the driver at the back and a large plastic box at the front where children sit. 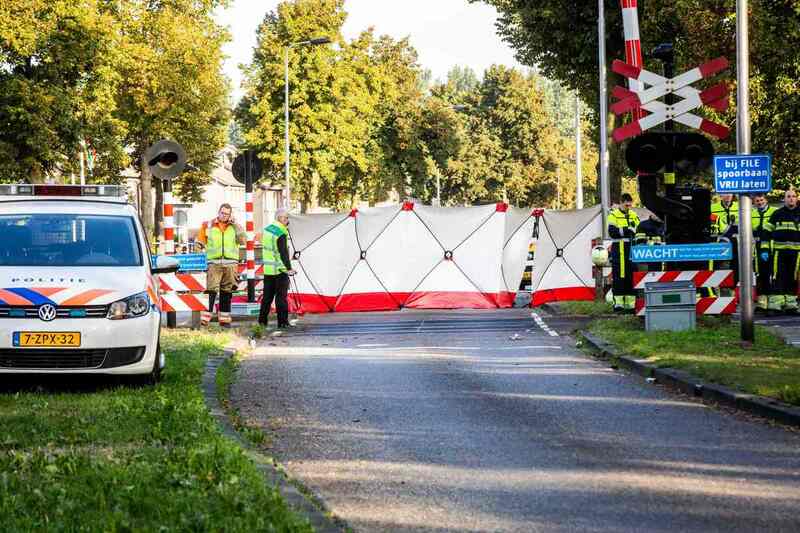 Reports in Dutch media said the 32-year-old woman driving the wagon had screamed for help after somehow ending up between the closed barriers of the level crossing, and that children's rucksacks could be seen flying in the air when it was hit by the train. The cart had just dropped some children off at a local school and was on its way to another when the crash happened. Local police chief Dianne van Gammeren refused to confirm that the driver had tried to stop but the brakes did not work, saying: "I cannot comment on that at the moment, which is part of the inquiry". Edwin Renzen, the founder of the Renzen company that makes the Stint wagons, was quoted by NOS broadcaster as saying that "this is the worst nightmare of any parent." "This is incomprehensible. We are parents and spent years developing the Stints ourselves. I don't know what I can do, but I just have to go to Oss," he was also quoted as saying by the ANP news agency. Around 3,000 Stints are in use throughout the Netherlands to transport around 60,000 children weekly, according to Renzen. They are used by many daycare centres to ferry children around towns in the Netherlands, which has a huge network of bicycle paths that they can take. Officials had earlier said that the children were on a cargo bike, which is similar but smaller and relies on pedal power. The train, which was carrying 57 passengers from the eastern town of Nijmegen to nearby Den Bosch, was equipped with a front-mounted video camera that will be used in the investigation, officials said. Dutch Prime Minister Mark Rutte tweeted from an EU summit that he was "deeply affected by the incredibly sad news from Oss where four young children have died in a horrible accident. "I wish everyone involved much strength with this heavy loss," Rutte said. Queen Maxima of the Netherlands said she and King Willem-Alexander "have no words" and that their "thoughts go out to all families who have lost their children"
The head of the Dutch rail infrastructure firm Pro Rail said it was a "day of mourning and sadness." "This is a rare blow. There will be a thorough investigation, and we will do our utmost to never let this happen again." It was the sixth such accident at the crossing since 1975, ANP said. In July the Dutch safety board OVV slammed as "unacceptable" the fact that 11 people die in accidents on level crossings every year on average. It said that "the Netherlands is the only country in Europe with a high volume of train traffic and a large number of level crossings -- two features that do not go well together."